There are three sure signs that autumn is fast approaching: the leaves begin to change color, pumpkins start showing up everywhere, and Halloween candy hits the stores. Perhaps the most ubiquitous of all seasonal sweets is Candy Corn. Candy Corn dates back to the 1880s, and was the brainchild of George Renninger, an employee of the Wunderlee Candy Company in Philadelphia. The shape and colors are meant to resemble actual kernels of corn, though size-wise the candy is about three times as large. Candy Corn was originally made by hand and contained sugar, corn syrup, confectioner’s wax, fondant, and marshmallows. The mixture was warmed and poured into buckets, before being transferred to kernel-shaped molds by men called “stringers.” It took three passes, one for each of the colors (white, orange, and yellow). The process has since been automated, but the recipe is largely unchanged. 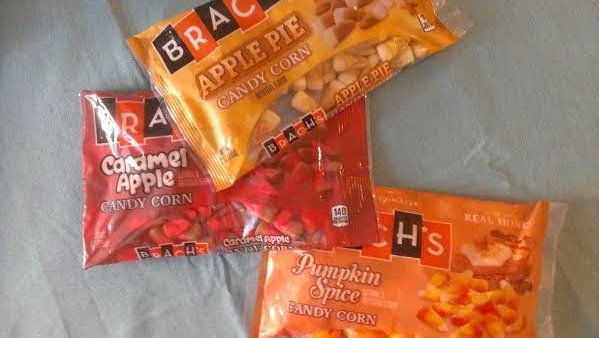 As popular as Candy Corn is – Brach’s sells between 9 billion and 15 billion kernels every year – it’s also one of the more reviled candies, ranking poorly in some consumer research polls. My own family would seem to back this up: neither my wife nor daughter are fans, though I love the stuff. You can find more information on our National Candy Corn Day post from last October. Different variations of Candy Corn are available year-round these days. Over the past few years, new seasonal flavors have been added, including caramel apple and green apple (2011), pumpkin spice and S’mores (2013), and caramel macchiato and apple pie (2014). We decided to review a handful of these newer flavors, settling on caramel apple, pumpkin spice, and apple pie. All three varieties had the same chewiness and “mouth feel” as regular ol’ Candy Corn, but diverged from there. The caramel apple were the worst. They lacked any discernible flavor, making the effort of eating them pointless. 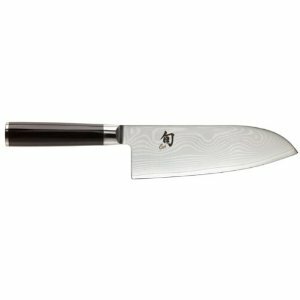 Rating: 1 Knife. Don’t waste your time. The pumpkin spice, at least, had plenty of pumpkin spice-y flavor – a little too much, IMHO. I don’t blame Brach’s for jumping on the pumpkin spice flavor trend; we can thank Starbucks for that, with the explosive popularity of their seasonal pumpkin spice lattes. These had the same flavor profile, and definitely woke up the senses. And dammit, they smell just like autumn. Rating: 3 Knives. OK in small doses. The best of the bunch, by a long shot, were the apple pie. Believe it or not, they taste exactly like their namesake: you get clear hints of apple, cinnamon, and brown sugar. I was tempted to warm them up and add a scoop of vanilla ice cream. Candy Corn à la mode, anybody? 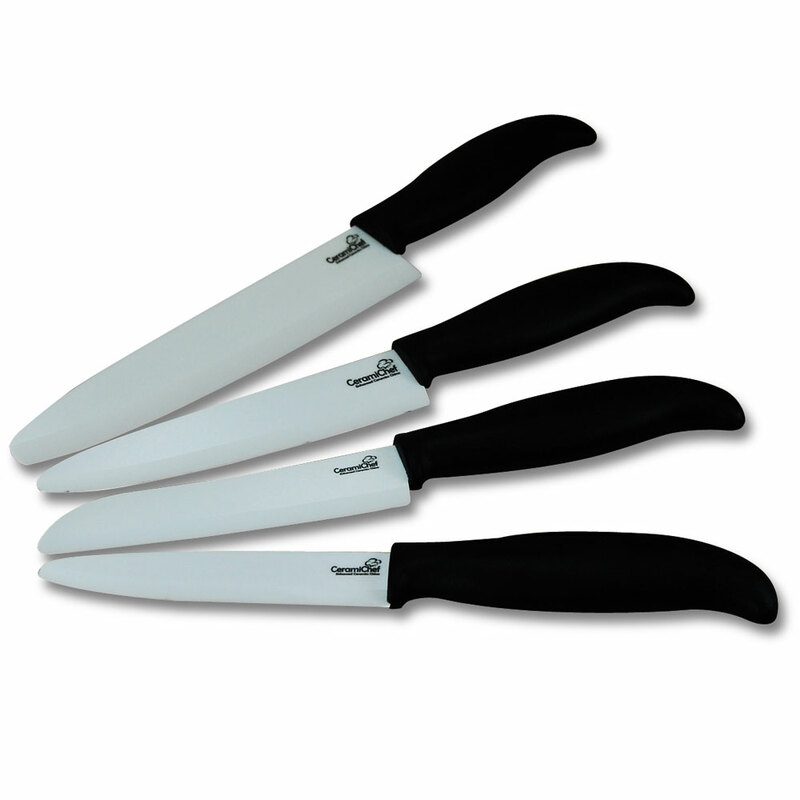 Rating: 4 Knives. The resemblance to real apple pie is uncanny. An apple a day might keep the doctor away, but it won’t keep Betty from crashing your party. October 5 is National Apple Betty Day! 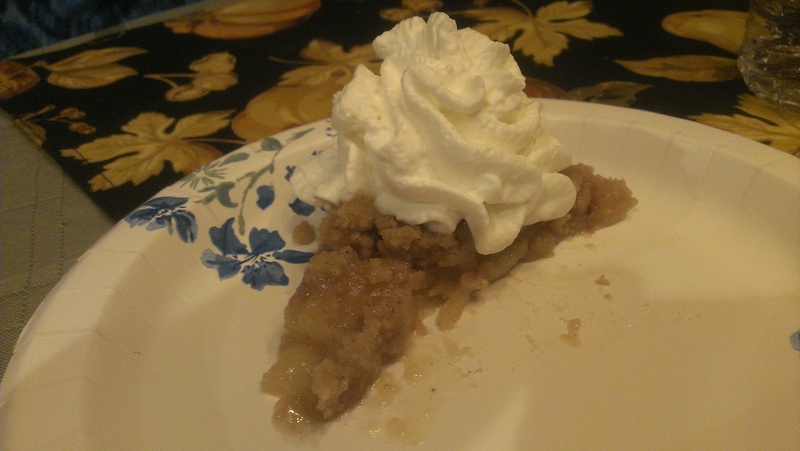 Apple Betty (also known as Apple Brown Betty, Brown Betty, Apple Crisp, and Apple Crumble) is an American dessert dating back to Colonial times. It’s like a cross between a cobbler and a bread pudding, and consists of layers of apple seasoned with cinnamon, nutmeg, and brown sugar, and buttered or sweetened bread crumbs. It reminds me of a deconstructed apple pie (I’ve always thought “deconstructed” was a cop out chefs use when they run out of time to properly finish a dish). The recipe first appeared in print in the Yale Literary Magazine in1864, though there is no record of who Betty was, or why she had a dessert named after her. We do know that the “brown” refers to the brown sugar used to sweeten the apples, and that it was a favorite dessert of Ronald and Nancy Reagan. My mom once again helped out with this challenge. She made an apple betty and brought it over for dinner. Tara’s mom, Tracy, is in town visiting for the weekend, so we all had dinner together. Mad props to my mother-in-law for making a perfect whipped cream swirl on top of the apple betty. Which, by the way, was wonderful! It was like an apple pie with a crumb topping instead of a crust. Delicious stuff. Thanks, moms!